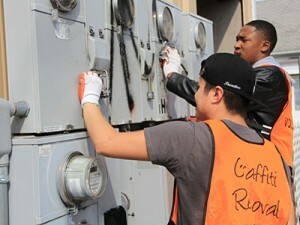 Classes were cancelled for Common Day of Service at Warner Pacific as the campus focuses on serving the community today, September 16, 2014. “Where faith and scholarship lead to service,” is the motto of Warner Pacific College, and it was put into action today as 415 students, staff, and faculty members stepped out of the classroom to serve the Portland community as part of the College’s 10th Annual Common Day of Service. The work completed (almost 2,075 combined hours of volunteerism) served more than 1,500 people, at 19 sites, and provided an estimated economic impact of nearly $43,100. The Common Day of Service began at 9 am with students gathering in the College auditorium for a brief time of prayer before being sent out to sites throughout Portland. The 19 service projects included graffiti abatement in local neighborhoods, removal of invasive plant species and general clean up around Mt. Tabor, facilities improvements at local schools and community organizations, hunger relief, assisting with therapeutic activities for clients with cognitive impairments, and interactive projects with elementary and middle school students. The Common Day of Service began 10 years ago, when a student asked local schools and organizations how Warner Pacific could help support their efforts in the community. Since then, the event has been embraced by the entire College and is a welcome way to kick-off each new school year. Last year our students gave almost 51,000 hours of service in the city of Portland, volunteer hours worth about $1.1 million to the community. 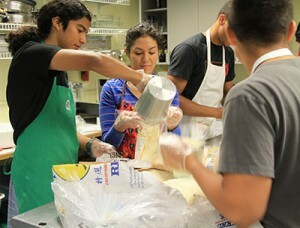 Warner Pacific students are asked to complete a minimum of 10 hours of service each year. Over 33% of Oregonians volunteer annually, one of the highest rates of volunteerism in the U.S. Education, religious, and social service organizations receive the most volunteer hours in Portland. View more photos on our Facebook page or Instagram feed.